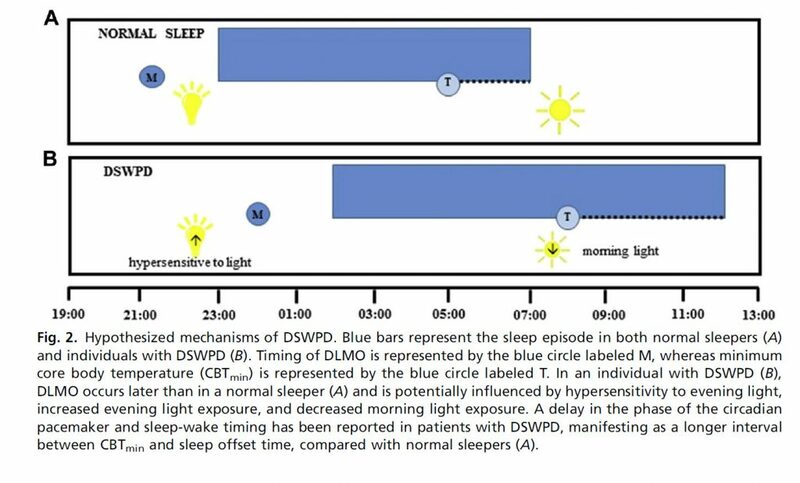 Delayed circadian rhythms occur in a condition known as delayed sleep-wake phase disorder (DSWPD). This condition needs to be distinguished from disrupted circadian rhythms, a condition in which there are no strong circadian rhythms and therefore it’s hard for people to fall asleep, and when they do fall asleep they tend to have fragmented or light sleep. People with delayed circadian rhythms should have reasonably strong circadian rhythms but their normal circadian rhythm does not allow them to get to sleep early enough so that they can get a full night’s sleep before they have to wake up in order to go to work or perform some other daytime activity. In practice this distinction is not perfect. It turns out that a number of people with delayed circadian rhythms also have somewhat disrupted rhythms, meaning that their sleep is not as deep even once they do get to sleep as those without insomnia. People with DSWPD sleep a normal amount (or even somewhat more than a normal amount) when they can choose their sleep schedule but find it extremely difficult to change their schedule in order to adjust to the need to wake up earlier. The prevalence of DSWPD is estimated to range from 0.13% to 10% of the population. and there is evidence to suggest that it is more frequent in adolescents and young adults and in males. Evidence supporting a genetic basis for DSWPD was just recently published in an article in the journal Cell (2017). Preliminary data suggests that this genetic variant could be a significant cause of DSWPD. Compatible with the idea that there is a genetic basis for this condition is the fact that treatment, which focuses on shifting circadian rhythms backwards in time, often has to be repeated. Generally treatment involves interventions designed to promote earlier sleep, earlier wakefulness, or both. A recent study found that, in adolescents, at least, the 3 mg of melatonin was more effective than bright light, although the combination was more effective than either intervention separately. van Maanen A, Meijer AM, Smits MG, van der Heijden KB, Oort FJ. Effects of Melatonin and Bright Light Treatment in Childhood Chronic Sleep Onset Insomnia With Late Melatonin Onset: A Randomized Controlled Study. Sleep. 2017 Feb 1;40(2). doi: 10.1093/sleep/zsw038. PubMed PMID: 28364493. Patke A, Murphy PJ, Onat OE, Krieger AC, Özçelik T, Campbell SS, Young MW. Mutation of the Human Circadian Clock Gene CRY1 in Familial Delayed Sleep Phase Disorder. Cell. 2017 Apr 6;169(2):203-215.e13. doi: 10.1016/j.cell.2017.03.027. PubMed PMID: 28388406.